La Tana di Leo is a unique restaurant with playground, where your children can have fun and entertainment in the large recreation area safely while adults enjoy the table-service restaurant and supervise their children from monitors. Babies aged 0-24 months, can enjoy the experience for free, excluding menu. Please note that there are limited seats, so book your dining experience and entertainment. Spend an unforgettable day with your children or celebrate their birthday! 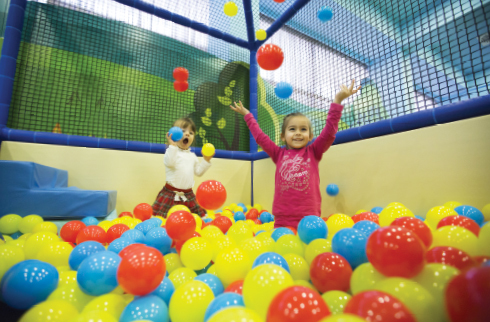 Leolandia, located near Bergamo and Milan, offers an indoor playground for older children. The children can play in a playground with climbing frames, slides and many more! They will have fun with our LeoStaff, who will entertain them with games, songs and baby dance. In the meantime, their parents can have a relaxing dinner. Safety and fun is guaranteed even for the youngest kids thanks to the safety flooring as their parents can enjoy their dinner. Children can let their imagination run wild playing with soft blocks, feel like real cowboys or cowgirls by competing in mini-rodeos and test their manual dexterity and balance with different games! Even babies up to 24 months can have fun at “La Tana di Leo”! The babies, who must be accompanied by their parents, can play with plenty of soft blocks and have an area where they can crawl across and meet new friends. In this world of leisure and magic, our entertainment programme is waiting for your children on the first floor above “La Tana di Leo” to sing and dance to the rhythm of baby dance songs. Children and adults can join the baby dance with Leo and characters from Leolandia! An you can snap a photo with them! 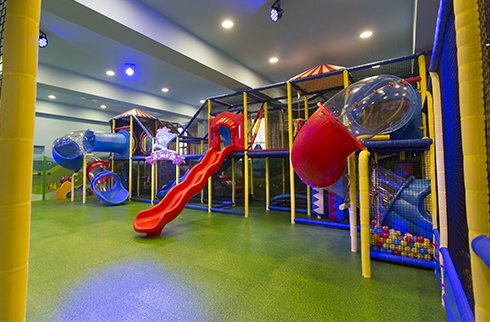 This unique and exclusive location near Bergamo is a wonderful spot to organise your kid’s birthday party in our indoor recreation area! You can book your table and, during the reservation process, order your customised birthday cake. For further information, please call us on +39 02 99 99 11 62*. Are you looking for a magical place to celebrate your children’s birthday to the fullest? La Tana di Leo is the right place for you! Plan an unforgettable birthday party for your children with the unique and customised cake and find out how to add a touch of magic and novelty to your party. Take a deep breath and relax at dinner with your friends. Enjoy our table service while your kids are having fun: our restaurant offers a wide selection of dishes and different menus specially designed for your children! Make your reservation now. Enjoy this dining and entertainment experience, which is especially designed for the little ones: this way you can reserve your table for you, your family or friends! When you come to our restaurant, you can select different tasty dishes prepared by our chef. GROUP OFFER: For groups of over 20 people, please write to [email protected]. Please ensure you book for your group using only one form and come with your entire group to La Tana di Leo: this way you can help us keep everything organised! BUY online YOUR MENU WITH FUN! Book now your table online! Moreover, if the day you have already booked, you can not come, do not worry, you can move your booking to the first available date by contacting us at 02 99 99 11 62* or by writing to [email protected]. Your reservation ensures that a table will be available to you at the restaurant in addition to the playground at La Tana di Leo… seats are limited! Car parking is free*! The access to indoor playgrounds at La Tana di Leo is only permitted with non-slip socks. From Monday to Friday 10 a.m. - 5 p.m. Copyright © 2015-2017 - Leolandia Viaggi S.R.L. - Tutti i diritti riservati.